Slow down and look both ways. Maintain your speed and look both ways. Stop, then inch forward until you can see clearly in both directions. Drivers must slow down when approaching an intersection. If a clear view of cross traffic is obscured, a driver should come to a stop and inch forward until they can see clearly in both directions. Turn left and find another route. Follow the other vehicles and enter the intersection. Even if you are facing a green traffic light, do not start across the intersection if there are other vehicles blocking your way. If you are caught in the intersection when the light changes to red, your vehicle will block cross traffic. You can get a ticket for blocking an intersection. This is the shape and color of a __________ sign. 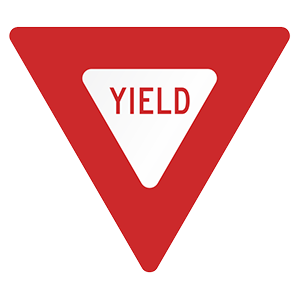 Downward-facing triangular signs mean drivers must yield. When approaching a yield sign, slow down to a speed that is reasonable for existing conditions and stop if necessary. If you must stop, do so at a marked stop line, if it exists. Use your low beam headlights when following a vehicle at a distance of 300 feet or closer. High beams can reduce visibility when shining directly into a driver's face or mirrors. There is zero tolerance for alcohol use by drivers under age 21. If you are under 21, the detection of any trace of alcohol in your system will result in stiff penalties, including the suspension of your license for two years. Must yield the right-of-way to any vehicle in the funeral procession. May drive between the vehicles in the funeral procession. Must pass the funeral procession on the right. 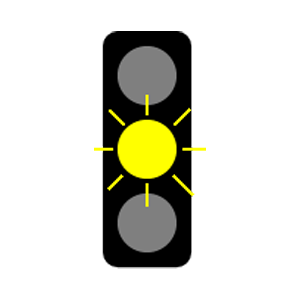 A driver in a funeral procession facing a red signal may continue through or make a turn at the intersection. Other vehicles, even if they have a green signal, must yield the right-of-way to the vehicles in the funeral procession until all vehicles in the procession have passed. Expect the child to be in total control of the bicycle. Children on bicycles are sometimes unpredictable. Young bicyclists are especially likely to make surprising changes in direction. Remember that children and bicycles are both small in stature and may become difficult to see. Come to a complete stop as quickly as possible. Stop and proceed only when the intersection is clear. When encountering a flashing yellow light at an intersection, you should slow down and proceed with caution. You do not need to come to a complete stop when approaching a flashing yellow light.